Disney’s 1991 animated film “Beauty and the Beast” has grossed $425 worldwide and won two Oscars and a Golden Globe while the recent live film remake grossed more than $1 billion worldwide. First performed at the theater in 2004, “Disney’s Beauty and the Beast” has made a joyous return, taking over the North Shore Music Theatre’s traditional family slot through July 30, and it again showcases the same qualities that made for a long Broadway run and many successful regional productions: a winning book by Linda Woolverton, a superb score, and production numbers that show off Disney’s trademark creativity and imagination. Beautiful young Belle (Rose Hemingway) lives in a small French town with her father Maurice and is a bit of an outsider, wrapped up as she is in her books. Andrew Kruep has the requisite touch for slapstick and physical comedy as Gaston’s hapless follower Lefou. The very petite Hemingway appears to be every bit a Disney Princess, even if she isn’t actually a princess, and sings and moves beautifully. As Maurice, Belle’s somewhat addled but loving father, David Coffee does his usual strong work, already having shown the good sense to leave the Texas heat for Cape Ann and his 24th season and 54th production at NSMT, where he’ll again star as Ebenezer Scrooge in “A Christmas Carol” in December. Trouble ensues when Belle goes off to rescue Maurice in the woods, and after being pursued by wolves, she runs into the castle where Maurice is being held prisoner. The castle is ruled by a Beast (Stephen Cerf) who had once been a handsome prince, but had been put under the spell of an enchantress after he sent away a poor woman seeking shelter from the cold. Meanwhile, the prince’s servants have been turned into household objects as part of the spell. The imperious head of the household, Cogsworth (Phillip Taratula), is distressed to find the wind-up stem in his back is the latest reminder that he might be turned into a timepiece forever. 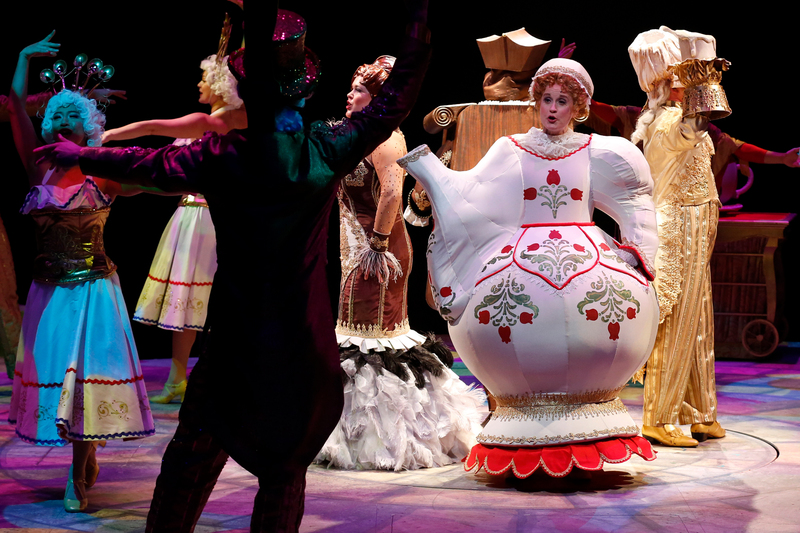 Christiane Noll is just right as the amiable Mrs. Potts, the teapot accompanied by son Chip, performed by promising young actor Ben Choi-Haris. 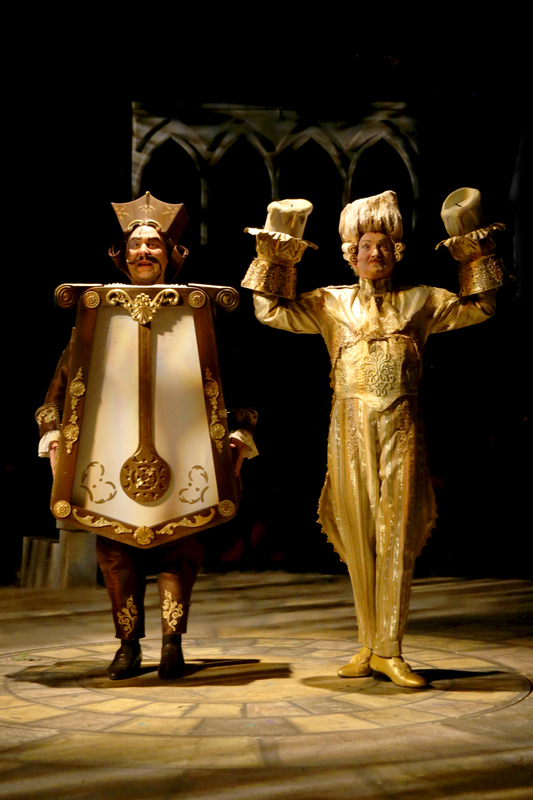 Noll has the pleasure of performing the Oscar-winning “Beauty and the Beast,” while Ryah Nixon and Joy Hermalyn provide some sharp comic stylings as, respectively, a flirty French featherduster named Babette and the opera-singing dresser Madame de la Grande Bouche. 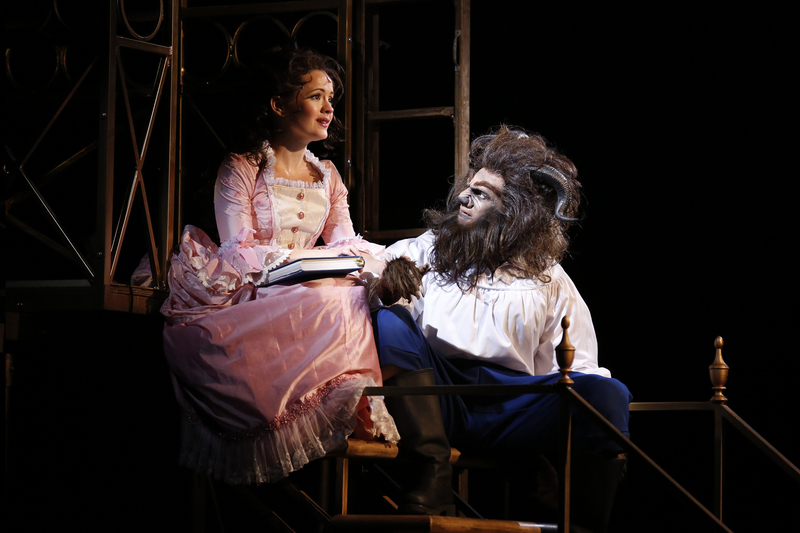 Stephen Cerf as The Beast has the show’s toughest role, morphing from monster to a warm, fuzzy friend, showing both vulnerability and confusion as he struggles to profess his love for Belle and be loved back, the only thing that can break the spell. The show proved children can be away from their video games and cellphones for an extended period, sit still and pay attention to what’s in front of them and appreciate it. It helps immeasurably that what they’re paying attention to is both live theater and a production worthy of their attention.